Biscochito cookies are served year-round at Casa Escondida Bed & Breakfast, a Santa Fe area B&B which is located in historic Chimayo, NM (just 35 minutes North of Santa Fe, on the High Road). Biscochitos are best known as the delicious holiday cookies that are traditionally served throughout the holidays in New Mexico. This is an easy, rolled, cookie cutter recipe. 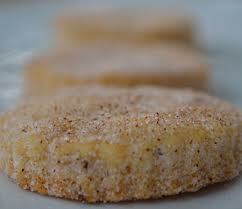 Biscochitos are similar to a crisp sugar cookie but with a delicate background flavor of anise added. The light cinnamon and sugar coating that they are dusted with, just before baking is perfect! Biscochitos are also the official “state cookie” of New Mexico. Ring in the holidays with a taste of New Mexico! Enjoy this Casa Escondida Bed & Breakfast holiday cookie recipe. Cream lard, sugar & eggs together. Add remaining ingredients & blend. Roll the dough & cut into cookies (add 1/4 C cold water, if the dough is too stiff to roll). Coat unbaked cookies with a blend of sugar & cinnamon. Bake at 350 degrees on an ungreased cookie sheet until golden brown (10 – 12 minutes).